With the recent comeback from girl group BLACKPINK, Papa Yang has gone a bit crazy with his Instagram updates. When the group breaks record for having the fastest music video to reach a certain views, there is an update. When the group tops an iTunes chart from another country, there is another update. At first, his frequent Instagram updates may come off as “cute” or Papa Yang being very proud of BLACKPINK for their mega-success. And yes, the girl group actually deserves even more for their great achievement over such a short amount of time. However, if it gets too much (and in many people’s opinions, it has already gotten too much), it can seem very intimidating, almost too pressuring. BLACKPINK is already a sensational group not only domestically, but also internationally. It’s almost definite that their success will never end. So will Papa Yang’s updates also never end? What will the artists think when he suddenly stops updating on their achievements? Is he going to do this to all artists despite their actual results? It’s been 5 days since BLACKPINK made a comeback with their first mini album ‘Square Up’ and 4 days since they had their “DDU DU DDU DU” comeback stage. The comeback was a huge success, with “DDU DU DDU DU” becoming the fastest K-pop girl group music video to hit 70 million views. It is definitely a cause to celebrate, and the group gained recognition for their achievement, even from American Forbes Magazine. 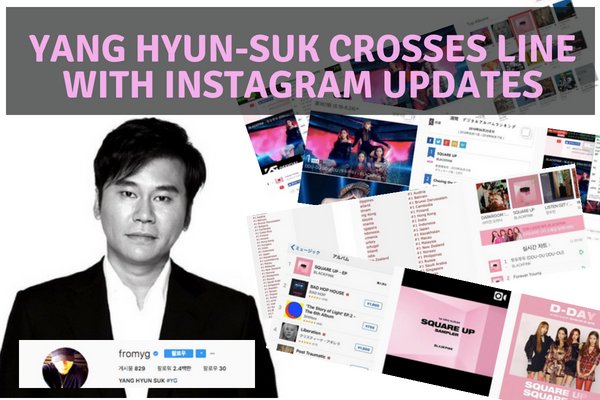 From the moment BLACKPINK release their new song, Yang Hyun-Suk took to Instagram to “congratulate” the group for their successful rankings on music chart. However, he continued to do so with hourly updates, capturing domestic as well as international rankings every hour. The problem began when these excessively frequent updates started to annoy the fans. 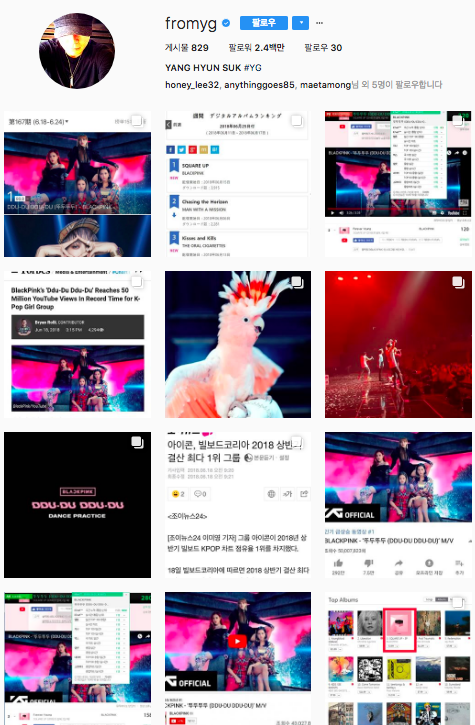 When it reached over 8 posts within hours, netizens started to comment that Yang Hyun-Suk had gone overboard. Many criticized him for focusing only on the numerical and tangible results from his artists. Furthermore, netizens argued that instead of congratulating them on the results, he should have promoted them prior to the comebacks. As a matter of fact, this was a serious problem for most Blinks (official fandom name). While other companies are dying to promote more and more of the artists’ comeback, Blinks only got each member’s moving posters, music video teaser, and an album sampler. Not much considering that this girl group, despite being a rookie group, had an 8-month long gap since their promotions. Now, we need to understand that Yang Hyun-Suk, despite the outcome, only did this with good intentions. He was only proud of his artists for their achievements as a rookie group, and wanted to congratulate them. Also, he has previously used the power of his influence on social media for other good causes. He used it to communicate with fans, reassuring them about comebacks and life updates on the artists. Therefore, he just needs to find a better way to express his pride and love towards his artists. For example, Park Jin-Young from JYP is known for being close with his artists. Most of them call him hyung or oppa, the terms you can only use to people you actually have close relationships. 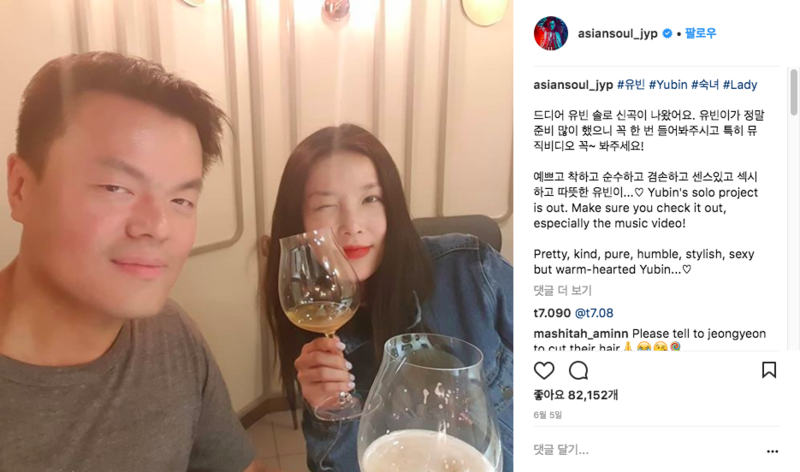 Whenever Park Jin-Young posts about his artist, he always includes a heartwarming caption that goes along with the artist. He does not boast nor mention the actual results of the artist’s comeback. By doing so, JYP proves that he supports his artists with their music careers, no matter the results. With the recent solo debut from Yubin, JYP posted a picture of the two together, cheering her on for embarking on her first journey as a soloist. While it is never a problem for a CEO to be proud of his/her artists, they need to find a proper way to show their affections. This can go in many different ways, you just have to find the one that is appropriate. You can be like CUBE’s CEO Hong Seung-Sung and write a heartfelt letter to express his love for each and one of his artists. Or you can be like BigHit’s Bang Si-Hyuk and share what your ultimate goal is with the group during a public interview. But, hitting a refresh button every hour and updating the results with only hashtags to accompany is just not the right method.